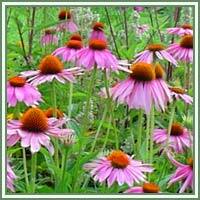 Latin name: Echinacea angustifolia D.C.
Habitat: Echinacea is native to North America. Description: Herbaceous, perennial plant. It has an erect stem and alternately arranged leaves. Leaves are lanceolate, linear, elliptic or oval-shaped. Each flower-head is placed on a separate long, erect stem, with brownish-red individual flowers. Medicinal use: Echinacea has traditionally been used to treat colds, flu, different types of infections, wounds and skin problems(such as acne and boils). Since it stimulates the immune system, it helps our body to fight infections and can be used as a prevention and to ease the symptoms of common cold and other upper respiratory infections. 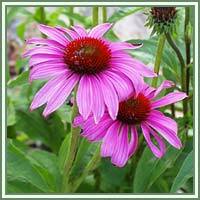 Echinacea is also used against flu, urinary tract infections, vaginal yeast infections, genital herpes, bloodstream infections, gum disease, tonsillitis, streptococcus infections, syphilis, typhoid, malaria, and diphtheria. Echinacea has also shown to be helpful in treatments of acid indigestion, rheumatism, migraines, rattlesnake bites, and attention deficit-hyperactivity disorder.